Intended for patients up to 320 lb., or those individuals with a severe biomechanical deficit, the Model 1017-A38 Automatic Angled Lever-Lock Knee Joint is the latest addition to our comprehensive range of orthotic knee joints. Equipped with 3/8 in. x 3/4 in. (9.5mm x 19.1mm) aluminum uprights, the Model 1017-A38 is modular in design and may be used in either a unilateral or double upright configuration. The Model 1017-A38 can be fabricated into a variety of orthotic designs including conventional metal and leather, thermoplastics, and composites. Incredibly light (600g). Friction brake is adjustable to release before toe-off for smoother ambulation. Powerful pneumatic cylinder handles wide variations in cadence. Patients can transition from security to dynamic capability due to combination of braking system and pneumatics. Designed especially for the moderate to full K3 ambulator weighing up to 220 lb. See our ad for our free gift promotion. The Smart Adaptive is an MPK for K3-K4 active amputees with a moderate to high level of voluntary muscle control. The new Smart programming mode reduces programming time. Using hydraulics for stability and pneumatics for efficient swing control, the Smart Adaptive learns how amputees move to allow greater confidence during locomotion. Gives support for stairs and slopes. Stanceflex for comfort and smooth progression through the gait cycle. Amputee may use any foot of his or her choice. Patient benefits: bolsters self-esteem, pride, and courage. Founder Dan Horkey pioneered an innovative method for applying artwork to braces and prostheses, empowering fellow amputees to express their individuality through custom orthotic tattoos. Print method applied over carbon-braid substrates. Airbrushing, hand painting, and pin striping. Painted systems (choose your favorite car color). Other painted finishes available. Call for details. Proud to be serving veterans. Sponsor logos available for triathletes and extreme-sport patients. Gift certificates are available. You may purchase Benzoin Compound Tincture U.S.P., Sprayzoin, and Benz-Protect through wholesalers, specialty distributors, or direct. Call today to order your free product sample! Genesis II foot/ankle systems, from MICA Corp., provide theindustry's most natural range of motion. The systems feature 12 degrees of axial rotation and vertical deflection in both directions, 12-25 degrees of inversion and eversion, 20-30 degrees of plantarflexion, and 7-15 degrees of dorsiflexion, with a promise for free bumper replacement for the life of the foot. Sizes 22-30cm for users up to 215 lb. Easily interchangeable bumpers with a lifetime guarantee. Thirty-day trial period from the time of fitting, with a 36-month warranty. 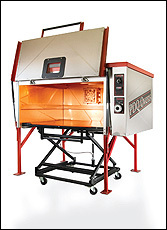 Get more use out of your PDQ Infrared oven by installing the Oven Fan Kit. Powered by shop air, the kit reduces production time for O&P plastics by up to 20 percent and provides controlled heating of pre-preg and TFC materials. Available as a factory-installed option on a new oven, the Fan Kit can also be retrofitted to an existing PDQ Infrared oven in about an hour. Fits all models except BT-1. The Axtion 1E56 is a lightweight, high-performance foot for active amputees. The foot's low structural height makes it a solution for patients with low clearance. New heel wedges make it easy to change heel stiffness, even without your tool bag. Plus, you can offer your patients multiple options with just one foot order. Featuring a highly flexible fabric for greater comfort and flexibility, the new Alpha® AK Sleeve from Ohio Willow Wood was designed for transfemoral use with suction suspension as well as with the LimbLogic™ VS for creating an airtight seal. The sleeve combines a unique blend of Kevlar pulp and traditional Alpha gel with mineral oil for increased durability and greater puncture and abrasion resistance without compromising comfort. Features 3mm Kevlar®-reinforced Alpha gel. Flexible fabric for greater comfort and flexibility. Use with LimbLogic VS for airtight seal. The new LOMBAR orthosis is a streamlined, low-profile, customizable orthosis that promotes thoracic extension through targeted vertebral separation. The "aluminum spine" provides strength while conforming intimately to the patient's body to provide stability and pain relief. The apron front closes with hook and loop Velcro® via dual pull tabs with finger pockets for easy, independently controllable, adjustable abdominal compression. Features include a soft CoolFoam liner. The aluminum posterior frame is easily contoured to the patient's anatomy. Strap lengths are "one size fits all" and easily trimmed. Superior lateral control. Available in standard and tall sizes. 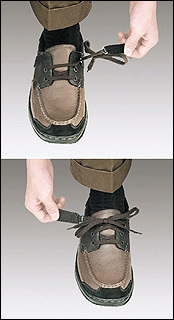 Orthofeet is now offering a large variety of shoes that feature the Tie-Less Lacing System. This patent-pending system combines laces with hook and loop straps that eliminate the need for lacing up, offering an ideal solution for people who have difficulties tying laces. Soft, seamless lining, padded with extra foam. Supple leather uppers with non-binding design. Visit us at AOPA booth 217. OPIE Software users can now take advantage of the most advanced ordering system available to an O&P practice, through integration with Cascade Orthopedic Supply. The integration includes a complete digital Cascade catalog, updated daily, which is searchable from within OPIE. When placing an order, users see the date their items will arrive, and if any items are backordered, they are immediately notified and given additional options. When items are shipped, the order is automatically updated in OPIE with a tracking link. Contact us to find out how you can get started with OPIE Purchasing & Inventory with no upfront fees and no risk. The innovative NINJA is a 6X mechanical-advantage orthosis, like a string brace, but using straps, not strings. The straps are more durable; they won't fray, tear, tangle, or wedge. The NINJA belt is the foundation of each brace (L-0627, L-0631, and L-0637) in the NINJA Progressive Spinal System. It has a soft mesh inside and an aggressive loop outside. The one-pull strap is easy to tighten and fasten. The NINJA PRO is pictured. With nearly effortless rollover, the Promenade prosthetic foot provides an excellent alternative for the diabetic and vascular amputees in your practice. The dynamic heel combines with a supple toe to provide users who have low-impact ambulatory skills with a more symmetrical gait. The energy return of the Promenade will assist basic ambulators in achieving efficient stride lengths and facilitate greater comfort and increased participation in daily activities. 325 lb. weight rating with 60-day trial period and 36-month warranty. Shape and skive foam, sand materials, and prep models at your station with our air belt sander. Save time and effort, and improve efficiency by bringing the equipment to your station with our portable, powerful tool. The 18 in. x 1 in.-wide belt creates a comfortable working area. Two hand grips are included for greater control. The sander comes with four belts. The new Summit™ 631 LSO limits motion and provides effective compression for the relief of lower-back pain. Aspen Medical's new LSO utilizes innovative materials and an ergonomic design to conform to the vast majority of patient anatomies without compromising support. 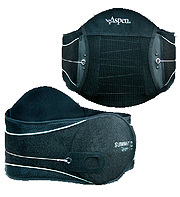 Conform back panel provides custom- silhouette feel while administering direct pain relief to the lower back. Ergonomic, comfortable fit toaccommodate diverse anatomies and diagnoses. Independent upper-zone and lower-zone tightening with SlickTrack™ tightening system. Dycor's new CFS Partial Foot incorporates an integrated custom silicone liner with an advanced carbon-fiber/epoxy composite socket and urethane/nylon composite upper for enhanced pressure dissipation and bulk reduction. The custom silicone liner is available in 4, 5, and 6mm with optional zone padding. The cosmetic cover is available in either a silicone or urethane/nylon composite. Function is facilitated with either a passive or flexible-keel foot and optional Velcro closure, depending on ADLs and ablation level. Modified model, tracing of contralateral foot, and shoe are required. Weight, including 5mm liner and flexible-keel foot, is 8 oz. (26med.). The ParaPod comes in a kit form that can be sized and assembled easily for significantly less than conventional HKAFOs. The kit provides an exoskeleton worn over clothing that consists of shoe clamps, aluminum uprights, foam knee blocks, and upper back and chest supports. The aluminum uprights are sized at the knee and hip and cut to length. Additional tubes can be cut to a longer length to accommodate growth. Our footwear stock includes BoxerDogs, Mt. Emey, and Answer2. We also offer Medicare-approved custom diabetic inserts, as well as toe fillers, prefabricated diabetic inserts, and other products pertaining to diabetic-foot management. We guarantee value pricing, huge product selection, and a commitment to excellent service you have to experience. Our 2009 catalog is available. ThermoTecc™ is the new heat-moldable orthotic system that saves you time and money. 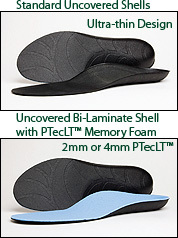 ThermoTecc orthotics provide maximum performance with a thin, full-length anatomically designed shell. The very dense 75-durometer lightweight EVA combines a flat bottom for stability with an extended longitudinal arch for mid-stance control and a lateral wall for better control. A deep heel seat with minimal heel raise allows for better biomechanical function, while the cuboid support minimizes lateral foot pain. The very thin and durable forefoot provides added control and is great for use in all types of footwear. ThermoTecc can be purchased as moldable shells or as a complete device with the addition of a PTecLT™ cushioning mid layer and anti-odor, anti-microbial, and anti-fungal BambooTecc™ top cover. Firm, 70-durometer posting strips and heel pads are available for further customizing your device. ThermoTecc footbeds are easy to cut, grind, and glue and are easy to trim to sulcus or proximal to met heads, minimizing the need for additional inventory. ThermoTecc is the most versatile and flexible orthotic system available. Peaster & Williams Central Fab is pleased to announce its primary focus is shifting to upper-extremity fabrication. With over 19 years of experience and a concentration on hybrid limbs, Jim Williams assists his clients with component selection and fabrication methods allowing them to provide their patient with the most functional and aesthetically pleasing limb. Peaster & Williams would like to congratulate Johnny Peaster on his semi-retirement after 37 years in the industry. Johnny is available on an "as needed" basis for your lower-extremity needs. Consider Peaster & Williams Central Fab for you upper-extremity fabrication needs. Liberating Technologies introduces the new M-Finger partial-hand kit, consisting of dexterous fingers, a multi-position friction thumb, and mounting plates for use in a mechanical hand assembly. The fingers and thumb have urethane covers to provide better grasp and molded-in finger nails for picking up small objects. The fingers are actuated by a Spectra™ cable that crosses the wrist and is controlled by simple wrist flexion. 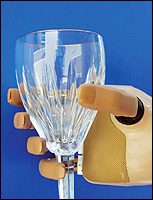 Each finger independently conforms to the shape of the object, allowing for multiple grasp patterns. M-Fingers are available in various segment lengths and can be customized to suit the patient. Multiple locking positions provide additional safety. Increased stability for patients with tentative gait. Easy fabrication with minimal follow-up maintenance. Works with any orthotic ankle design. Only design available for use in rehab knee orthoses. Bilateral or unilateral uprights for easy donning. Matthew Dobbs, MD, designed this new dynamic clubfoot bar to allow active movement, preserve muscle strength in the foot and ankle, and be less restrictive to the child than traditional fixed bars. Children using the Dobbs Bar can crawl and kick their legs independently. Children will sleep better because they can get comfortable in the Dobbs Bar, and heel blisters commonly associated with fixed bars are no longer a problem. The Dobbs Bar is available in two sizes, small (6 to 9 in.) and regular (8 to 14 in.). The bar is adjustable through each size range to accomodate growth. The foot plates are universal and can be attached to shoes and AFOs. The results are better compliance, a more active child, and happier parents.